I know that barn doors have been around for awhile now, but I STILL believe they are worth all the hype. Since Joanna & Chip put them on the map in home design, they continue to show up in tons of house plans and evolve: a character of timeless decor. Thanks to the Gaines’, we not only have stylish door options, but functional door options to problematic/awkward/tight spaces (and they are just plain fun!!) So if you haven’t jumped on board yet to this barn door craze – beware – this post is filled with tons of inspirational eye candy & products galore. So here are 55 Incredible Barn Door Ideas: NOT Just For Farmhouse Style. Looking to shop barn doors, try 28 Incredible Barn Doors: Get The Look. So what makes barn doors so special? They can even be used outdoors – yep check out #9!! SECONDLY: I have 2 barn doors in my own house: 1) a pair that replaced french doors to our office/piano room (see below), and 2) one in my bedroom to my master bath (see 2nd set below). And I absolutely LOVE them and highly recommend them! Both of these rooms had awkward areas for opening up the doors into the room. As a result, this awkward area became useless and really limited furniture placement. By adding the barn doors, we actually gained usable space, allowing for better flow/better function of both rooms. We installed the office doors on the outside wall (entry wall- above) to gain more space inside the room, and also to add detail to the tall foyer walls. In the bedroom we added one large door (below), and had it slide to an area that we did not use. It was a no-brainer for us! Click Master Bath Remodel: Hardware Accessories and Home Tour: Coastal Farmhouse Master Bedroom to see more of our home. ***TIP*** As you scroll through the different styles, keep a piece of paper handy and write down the numbers to the ones that really grab your attention. It will help you decide on pattern/color/style, and help you “picture” where you might want to use them in your own house. If you want to Follow my pinterest board – click BARN door love for more inspiration and tips. 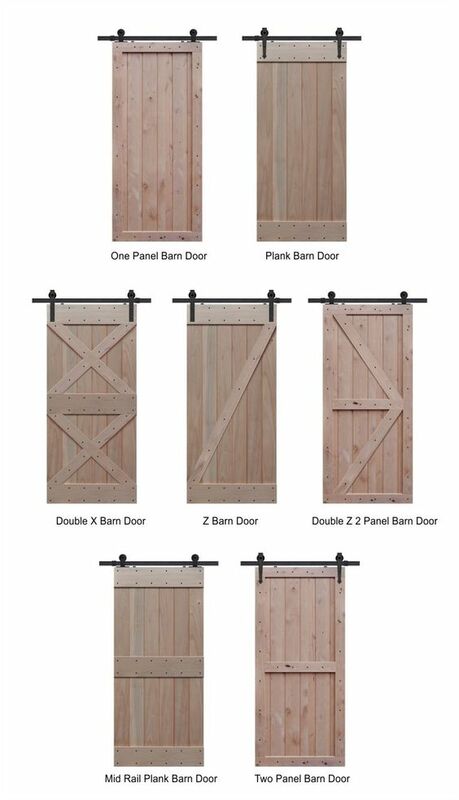 If you want to shop barn doors, click 28 Incredible Barn Doors: Get The Look. So…..let’s get to the GOOD stuff !! To shop barn doors, click 28 Incredible Barn Doors: Get The Look.